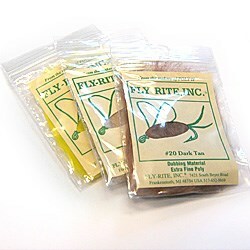 There's a reason why FLY-RITE is the best-selling poly anywhere . . . because it's the best poly anywhere! Their basic colors are sharp and true, and their insect and pattern colors are "right on" every time. Finally, their poly is polypropylene - not polyester - and Fly-Rite poly has a density less than water. Often copied but only very poorly. Capt Hamilton bend with longer shank for upwing and loop patterns. Long straight surehold point makes for excellent hook setting.